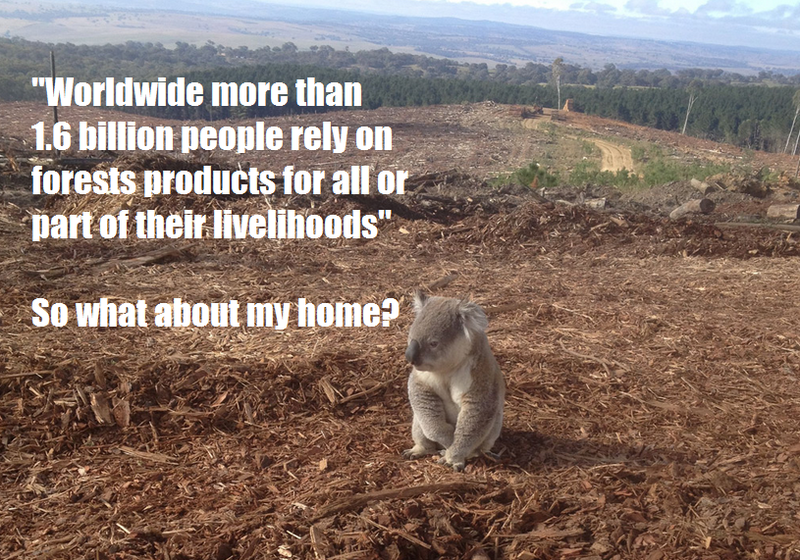 What Part of Unethical Conservation Don’t You Understand? | Endangered Species Monday Special. Last week we wrote an article in relation to the GoEco student/tourist travel firm, and the Zanchieta Wild Cat Farm. As usual we came under some pretty heavy criticism as apparently we were yet again in the wrong. 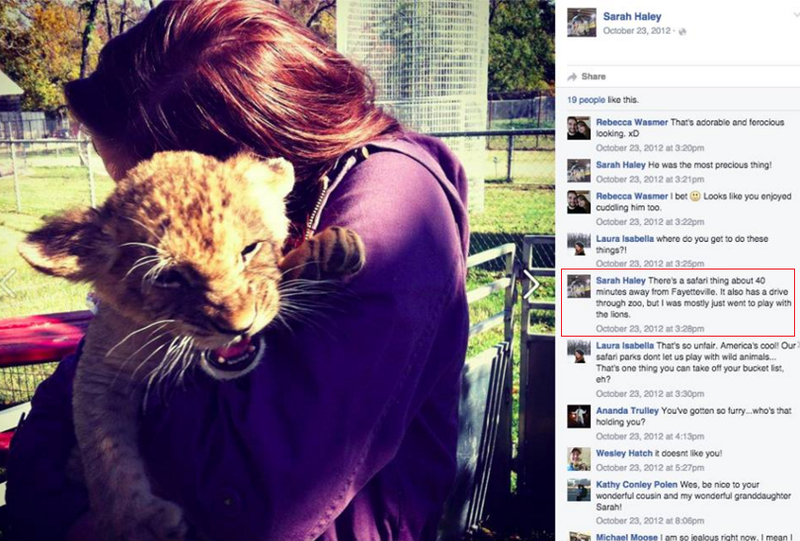 Within many of the emails that we have received, students have literally blasted us for depicting themselves holding, petting or interacting with African predator cats, many of them cubs that seem to have no mother insight, and could be re-rehabilitated into the wild to boost wild predator populations up. Back in 2015 from January to December we rolled out yet again another mass educational and awareness campaign aimed at mainly students and overseas tourists that paid up to $1,200USD for a two week visit to the many petting farms, lodges and resorts on the African continent, that was projected onto our main Facebook platform. I.A.R.F.A’s educational and awareness campaign (2015) saw over 200 students give up this practice (one of many articles you can read here). Furthermore Zebula Golf and Spa Club that was hosting lion petting activities withdrew the practice, and removed adds from their main website. An African zoological garden removed its advertisement for cheetah petting, thus later ending their petting experiences, and finally a painter and artist that was promoting such activities eventually stopped. The campaign also saw a decline in profit in relation to the Ukutula Game Lodge, and customer star rating, and less students visiting from 2014-2015. Amanzi Travel located within the United Kingdom have also allegedly withdrawn their lion petting advertisements focusing more on ethical conservation. (Amanzi Travel are still the focus of our attention though). The list goes on, and frankly we’re not going to stop until these practices are ceased immediately. From 2014-2015 the organisation Blood Lions pounded the streets and cinemas (internationally) in relation too the petting and canned hunting industry which has seen quite a significant response from the petting and hunting fraternity too). In the wake of much controversy France has implemented an immediate ban on lion trophies being brought into the country. Now PHASA are at the throats of (Sapa, reported by Blood Lions) demanding the South African Predator Association immediately responds to the canned hunting problem that’s sparked fireworks around the globe. (See video below). Unfortunately, despite the mass effort that we and others have placed into these projects, students, tourists, even trainee zoologists and veterinarians still thrash it out with us, believing that what they are participating in, is all good fun and doesn’t do the animal any harm whatsoever. Below are just a handful of the lame excuses that we read every week emailed to us in anger. 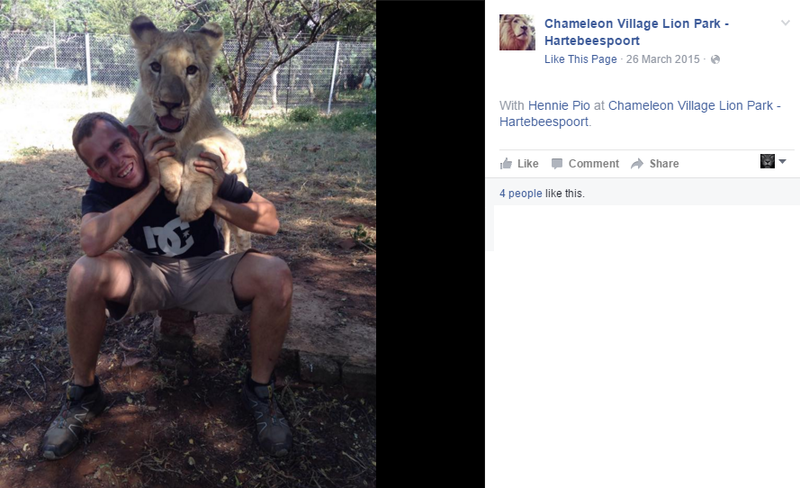 “The image you posted of me misrepresents me, all I was doing was holding the cub for a Facebook photo avatar. I’m doing nothing wrong”. The above lines are just a handful of lame excuses that we read everyday from tourists, students, petting farms, and alleged predator rehabilitation sanctuaries. Furthermore no matter how much we try to explain, either in basic English or with science – the fact of the matter is this: Many students, tourists and sanctuaries fail to see the damage that they are doing, and contributing too. Many of the students and tourists that we’ve highlighted as contributing too unethical conservation also scold us for using their images, stating that we’re misrepresenting them holding or petting a “predator cub”. So we’re going to try things a little differently. Back to basics. Below we’ve included a number of images, and under them images we’ve written a brief extract in relation to what’s wrong with each image/ real life scenario. However before we start, lets take a look at what real ethical conservation is within the “captive breeding and release industry”. 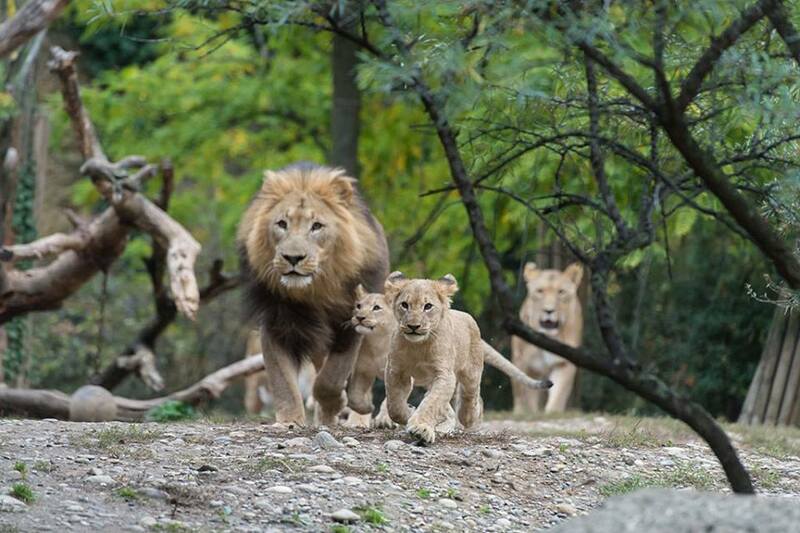 The image above was taken at Basel Zoological Gardens, and as you can see mother, father and three young cubs are happily strolling in the park on a fine late Spring day of (2015). There are no tourists, students or even the hint of petting, interaction, cuddling or manhandling on show here. Mother’s Oka and Uma gave birth to their cubs on May 28th, and June 15th (2015). Zoo Basel supports the Big Life Foundation, which works in the Amboseli-Tsavo ecosystem in Kenya to protect the Lions. The Zoo is also a participant in the EAZA Endangered Species Breeding Programme for African Lions. This means that every-single lion you see within a zoo that’s part of the EAZA Endangered Species Breeding Programme will eventually be released into the African wild, they’ll not be kept for photography purposes, or to interact with. For release programme’s to be successful human interference must be kept to a bare minimal. You’ll not see any petting, interaction, man-handling or public photography exploitation going on here. EAZA’s Endangered Species Breeding Programme is what we refer to as “ethical conservation within captivity”, and there is much evidence in relation to EAZA’s working projects too. 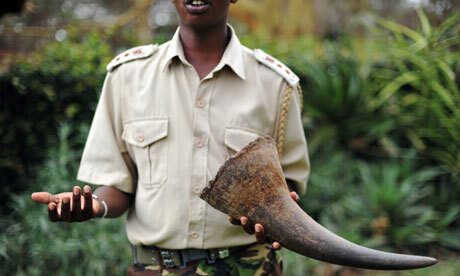 Below are prime examples of “unethical conservation practices”. From America too the continent of Africa you’ll not see EAZA’s Endangered Species Breeding Programme allowing this type of behavior. The reasons why you’ll not see such behavior played out within anyone of EAZA’s projects is listed below for your information in plain English. Back in 2012 Sarah Haley from Fayetteville, Arkansas, United States visited the Wild Wilderness Through Safari. Sarah’s reasons for visiting was quite simple. “I mostly went to play with the lions”. As one can see these lions are very young, and as normal there seems to be no mother or father in sight. What Sarah doesn’t realize is, the mother would have had her young ripped away from her at a young age, just so tourists and students can play petting. Mother and cub[s] would have been left in quite an emotional state, suffering psychological trauma, and would have pined for one another. Its more or less the same behavior a new born baby and mother will play out when separation occurs. Did it make you feel good Sarah knowing that you was holding a pining mothers cub that simply wanted to behave like any normal human or animal mother? There doesn’t appear to be any-form of breeding programme in operation at this alleged zoo either. Furthermore this cat will never be released into the wild, because all of its natural instincts have been removed by the human, and imprinted from the human onto the cub. Yet on the African continent we’ve lost over 50% of our lion populations. There doesn’t seem to be any form of hunting advertised, however we are somewhat suspicious here as to why so many cubs are being reared at this zoo, and what the so called zoo’s actual intentions are. Every month we bring into question many safaris, big cat projects, lodges and zoos. Many of them do not participate in hunting, while others are more than “questionable in relation to their mission statement and hunting”, and what they are actually projecting into the public domain (which most of the time doesn’t support their mission statement). Furthermore contradictions from the owners in regards to their companies mission statement are rampant among such alleged rehab and non-breeding facilities. The image above seems pretty innocent, and quite adorable to most. 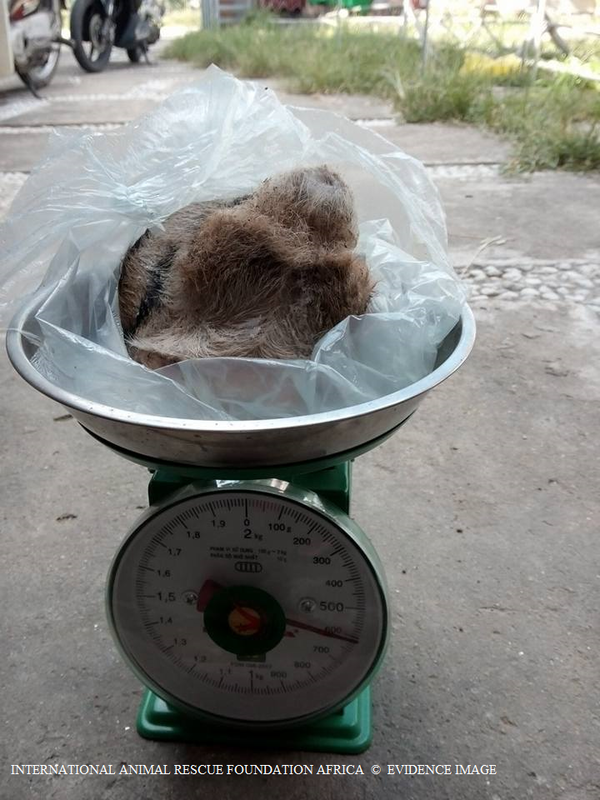 The image was posted onto the Zanchieta Wild Cat Farm Facebook page of which the Zanchieta Wild Cat Farm has venomously protected as innocent. Zanchieta have even gone to great lengths in the past week basically stating that were totally wrong, and everything that we’ve located in relation to their company (above and below) is more than legitimate. 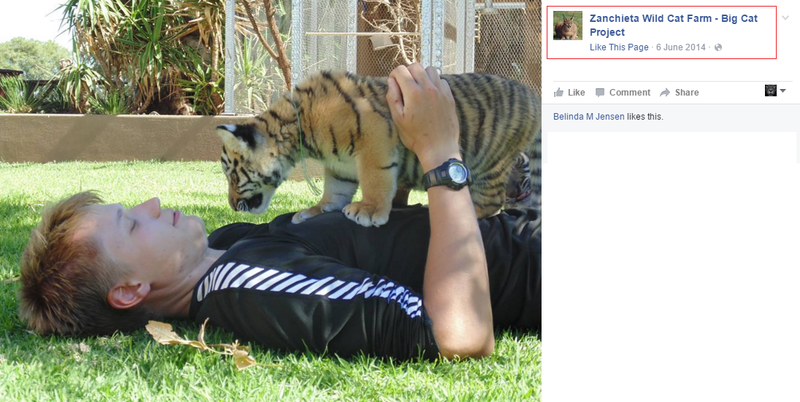 An insult that we did read stated: “We (Zanchieta Wild Cat Farm) know that this post by I.A.R.F. was done with good intentions, from people who, like us, love animals and fight for their rights”. We do indeed love animals hence why this article is proving wrongdoing and unethical conservation practices. I.A.R.F.A do not under any circumstances support such activities nor will we promote them either. (Please continue reading). What the young unidentified male seems to be forgetting is that this young cub “may” have been removed from his/her mother at the prime milking age of three weeks old. PAAZAB’s Husbandry and Veterinary Guide states: The cub should also be supported under its bottom with the other hand, cubs must be supported correctly as to not injure the young developing cub. Further to this we all know that cubs aren’t exactly hygienic like their adult mothers and fathers. Regardless of how much Zanchieta Wild Cat Farm defends themselves, the images projected onto their Facebook page are clear signs of “exhibiting to profit from money”. The worst is to come. Cubs this age want roam, explore, test their young muscles to develop coordination, and sleep for extended periods of time without interruption. They dislike being handled. 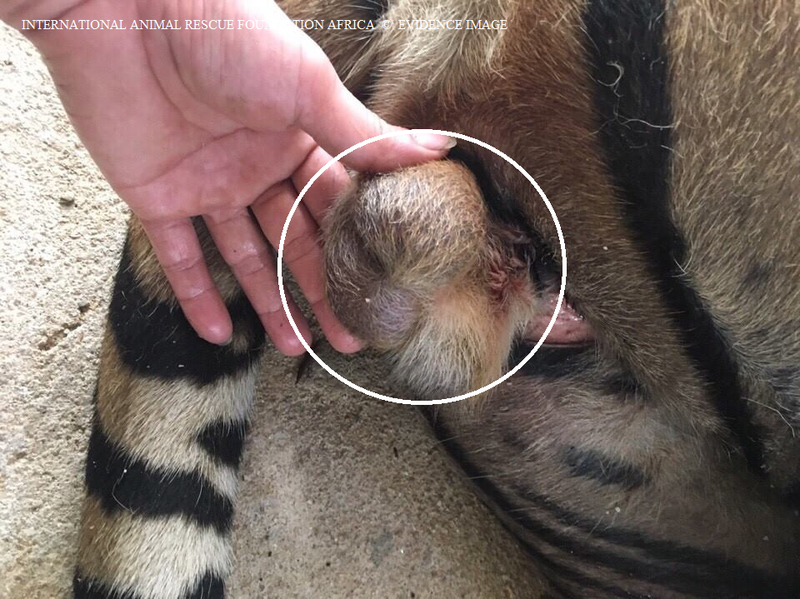 While Zanchieta Wild Cat Farm states that they protect, rescue and rehabilitate, this behavior is neither protecting the cub, or (at the least) trying to rehabilitate this young cub into the Asiatic wild where the number of tigers are about 3,200 if that remaining in the wild. The owner of Zanchieta states via her website “I have never and never will breed or raise any BIG CAT at Zanchieta for onward selling to a third party. Our white lion pride has grown from the original male and female pair to five lions and these lions will never leave Zanchieta”. We believe this statement was written back in 2010 when the main domain and site was formed and registered. Image: Timbavati white lion cub 2014. Image: Timbavati white lion cub (new born) 2014. 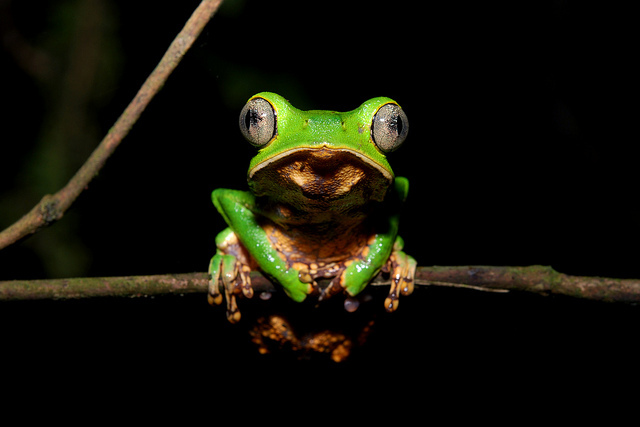 The Zanchieta owner states: “No further natural breeding will occur as the females are on contraception programs. Our two male brown lions and our brown lioness were purchased as cubs and have never been allowed to breed. They too will never leave Zanchieta.” That statement has been on the main Zanchieta website since 2010, yet the lady is not prepared to release these lions into the wild via ethical conservation projects. 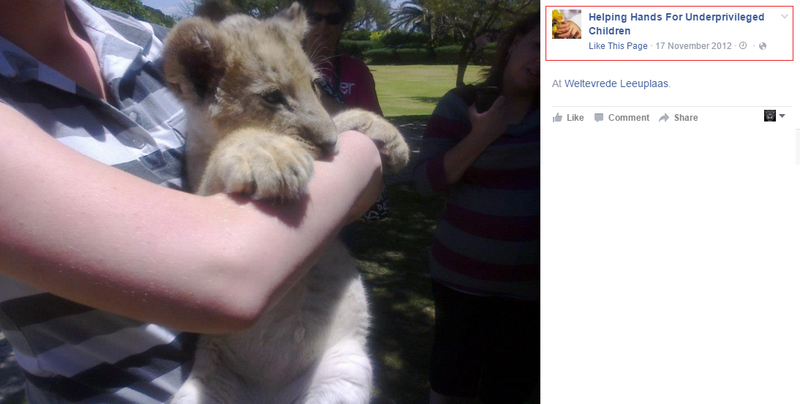 Timbavati white lions are as explained (critically endangered), so this statement is very questionable. Again where is the mother, but more importantly why is Zanchieta stating that none of her lions will be allowed to leave the farm? That’s a classical sign of unethical conservation for reasons that we do not fully understand. This lion as one can see (above) is only a few days old. Furthermore as the owner states none of the lions will be allowed to leave the farm. If you are familiar with the sub-species of the Panthera leo krugeri, you’ll also know that their populations within the wild are dwindling. So theoretically any good “rescue and rehabilitation project” that states they’re not breeding (when they clearly are), would try to improve Panthera leo krugeri populations within the wild like EAZA’s Endangered Species Breeding Programme. So in our (expert opinion), this farm is nothing more than a breeding and captive facility. Indeed there are some release projects ongoing however as the owner states (no lions leave). So instead students, tourists and volunteers can all help contribute to (nothing). That in our opinion is a complete waste of money, money that could be spent elsewhere on actual breeding and release projects to sustain threatened populations of predators. Whenever we explain to tourists and students about the petting and interaction industry, they’ll often absorb only a certain amount of information (in most cases), which is why education needs to focus more on every aspect of this industry rather than just hunting. Many Non-Governmental Organisations, and “anti hunting groups” out there, will categorically state on locating a petting/breeding farm, that hunting is the major player regarding their find. Most of the farms, lodges and sanctuaries that we’ve located aren’t actually connected to hunting whatsoever. So when a tourist or student hears them words I.e. hunting is not ongoing, they automatically believe that all is okay, we’ve got our wires crossed, and we’re simply trying to tar the name of a farm or lodge. 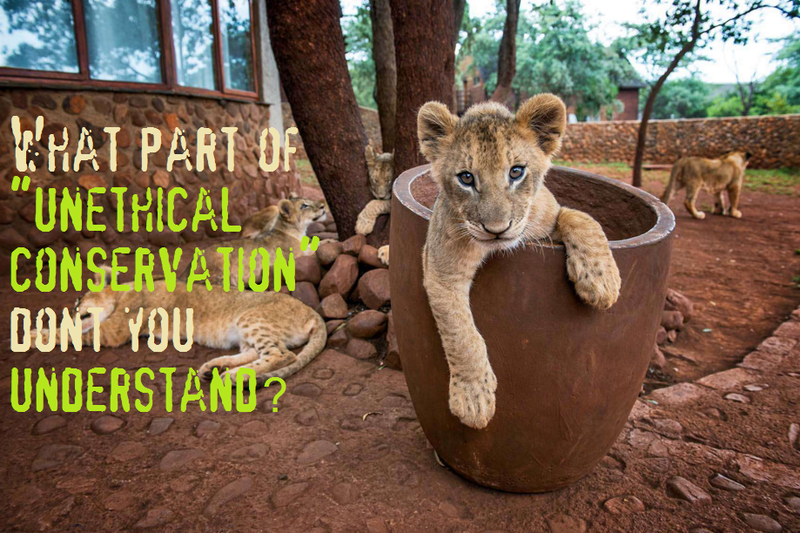 International Animal Rescue Foundation Africa researchers every single piece of detail on all industries and practices that we do not support practicing unethical conservation. 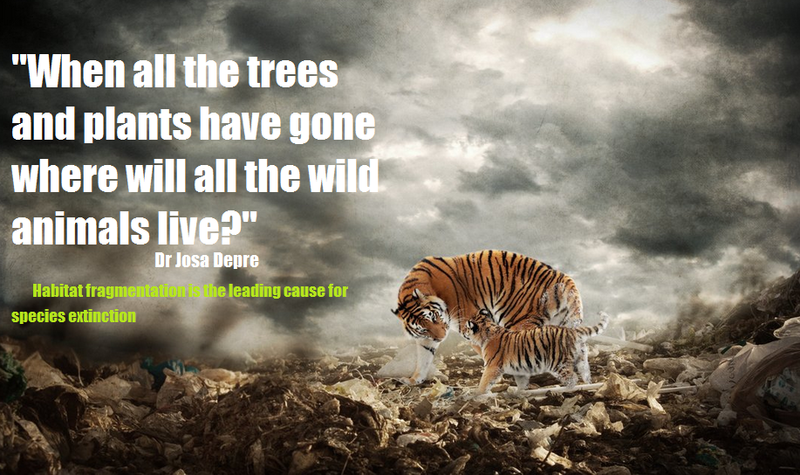 That includes petting, disease, hunting, abuse, exploitation, and failure to keep to promises (I.e): release programmes, or helping increase threatened species in the wild. Meet Mr Hennie Pio from South Africa. The image above looks very innocent again, and both the visitor and lioness seem pretty much laid back. Tourists need to remember that predators are like cats and dogs, they all have deeply embedded within their genes (hunting and predator behaviors). For E.g. I once owned a Springer Spaniel rescued as a puppy. That wee dog was domesticated like any other dog into an adult dog. A few years into life and on a long walk, my pet dog jumped the lead, and naturally went after hens and chickens killing three instantly with a single bite to the neck. Yet the dog hadn’t seen a chicken or hen before, nor had she been raised to hunt. The same applies to lions, tigers, cheetahs, leopards, and jaguars Etc. Just because they’ve never hunted naturally in the wild, and had humans imprint their natural behaviors onto them, doesn’t for one single minute mean that, that animal will not attack you. Listed below are real life captive predator attacks that left their owners or keepers, tourists and visitors with life threatening injuries or in some cases death did occurred. Jan 21, 2016 Australia: A 12 year old tiger has attacked a keeper at an Australian zoo founded by the late Steve Irwin. The incident, which took place Thursday morning at the Sunshine Coast’s Australia Zoo, left 41-year-old Che Woolcott with “significant puncture wounds” to his head and forearm, according to local media reports. He was treated at the scene before being transferred to the hospital. Nov 29 2015 Malta: Ħal-Farrug zoo was closed by its owners after a tiger severely injures a 3 year old boy. A spokesman for the zoo said the incident happened when the two handlers were walking the “friendly” tiger, which they had raised, outside its cage since it had been slightly unwell. The tiger was lying on the floor when the incident happened. Upon seeing the animal, the boy ran towards it, prompting the tiger to raise its paws, lashing the child in the face in the process, the spokesman said. Jun 1, 2015 Johannesburg, SA: Katherine Chappell, 29, a visual effects artist for Game of Thrones, was killed and her tour guide seriously injured in an attack by a lioness at the Lion Park near Lanseria. The two people were travelling in the car with their windows open. It’s understood a lioness jumped through the open window, biting the woman who was in the passenger seat. The driver, a tour guide, was badly injured while attempting to free the woman from the animal’s grasp. The park’s Scott Simpson said, “There was a car driving to the lion camp and the lioness came through the window and it bit the tourist. The ambulance arrived quite soon but the lady has passed away.” Three months ago an Australian tourist was bitten in the thigh while driving though the park, also with his window down. Please view the video below which shows the worlds top ten predator on human attacks, Mr Hennie Pio is in our opinion a very lucky man, like most of the students, tourists and visitors that man-handle allegedly “friendly hand reared predators”. They’re only friendly if they want to be. When you place yourself within a predators environment your acting irresponsibly, furthermore if that animal attacks you, its very likely the animal will be shot dead. Lastly if your lucky to walk away with minor or serious injuries its highly unlikely that your insurance will cover you, and you have very little chance of receiving compensation – because you placed yourself in that predators environment. While we all like to visit animal shelters, and provide a helping hand, one will find that some animal shelters and farms in the Western Hemisphere will point out to you the notices that inform you not to pick the animals up, touch the animals, feed them and always ensure that your hands are washed should you come into contact with animals. The reasons for these “polite notices” is to ensure you do not fall ill with anyone of the known zoonotic diseases that are fatal in some cases. The organisation identified (above) as Helping Hands for Underprivileged Children is where the image above derives from (click the link above that’ll direct you too the Facebook image). The image was picked due to myself being a parent, and because I know just how easy it is for a child to unknowingly place their hands within the mouth dozens if not hundreds of times a day. The data below we do advise you take seriously. When zoonotic diseases pass from animals to humans, pandemics can result. When a pathogen leaps from some nonhuman animal into a person, and succeeds there in making trouble, the result is what’s known as a zoonosis. The word zoonosis is unfamiliar to most people. But it helps clarify the biological reality behind the scary headlines about bird flu, SARS, other forms of nasty new disease, and the threat of a coming pandemic. 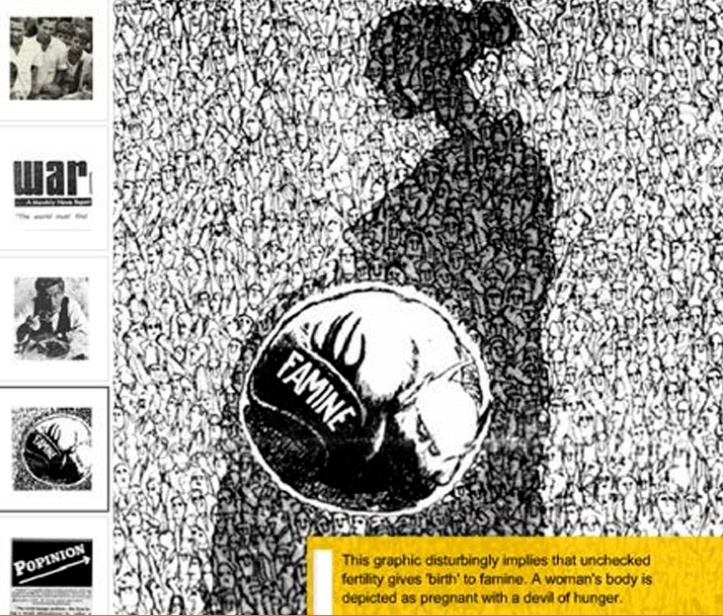 It says something essential about the origin of HIV. It’s a word of the future, destined for heavy use in the 21st century. About 60 percent of all human infectious diseases currently known are shared between animals and humans. Nearly all zoonotic diseases result from infection by one of six kinds of pathogen: viruses, bacteria, protozoans, prions, fungi, and worms. Toxocariasis is a mild zoonosis caused by roundworms; you can get it from your dog, cat or in this case a predator. But fortunately, like your dog, cat or predator, you can be wormed. 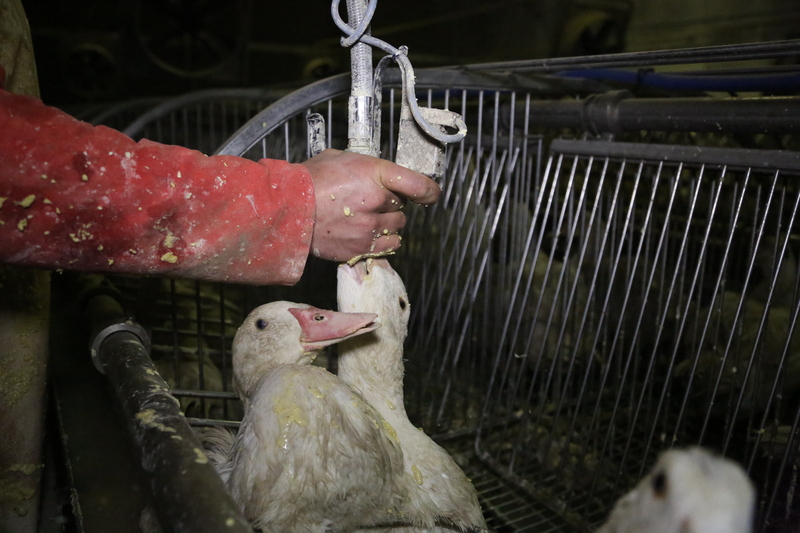 On some farms the owners lie to the public, and there is no way of telling if these animals are treated. Should the animal not be treated as the owners have advertised – your insurance doesn’t cover this either. Your unlikely to be compensated, and you could spend anything from 2 months to 1 year+ off work, or out of action. We have deliberately left out all mention of hunting within this article, because frankly many tourists, students and visitors that visit predator farms seem to believe that if hunting is not seen as the “major problem”, then all is as explained pretty much okay. The petting and interaction industry can at times be directly related to hunting, however there are as seen above other issues that you need to take into consideration over hunting. If you believe an image that we have posted “misrepresents you”, then just stop and think how that individual predator cat thinks about you misrepresenting them as a cuddly “pet”. International Animal Rescue Foundation Africa supports all EAZA’s breeding projects, reputable projects that do take in predators that are unable to be released into the wild, I.e: circus, rescues, domestic rescue Etc. We are able to view the lies and contradictions within each alleged rescue, lodge, farm or sanctuary and can if required go to great lengths to prove “unethical conservation practices are being played out here”, with more than sinister motives possibly attached. This article hasn’t been written to attack, or place blame, but more point to where problems are occurring within the predator breeding and petting industry. If your allegedly rescuing, and rehabilitating then please print and practice just that. If your not breeding and have stated all your animals are on contraceptives, then keep to that promise. If you knowingly understand ethical conservation and really do plan on helping wildlife in their endemic wild, then please practice that. Please do not mislead the public into thinking that your indeed 100% ethical – as we will find you, and highlight them problems always steering the public into the correct conservation path. If you feel that you’ve been led astray and would like to visit and participate in ethical conservation, please click the links below.